Direct mail is a much bigger investment than email, due to the cost of printing and the cost of fulfillment. So, to help you design direct mail pieces that your customers will be less likely to disregard, we asked 2,400 consumers why they ignore direct mail. In this week’s chart, we break down that information by different industries — from consumer goods to health care. After we published a recent article about why customers ignore direct mail, one of our readers hit “reply” on his MarketingSherpa Chart of the Week email newsletter and challenged the chart. “It also depends on the product and offer. Are you selling chewing gum, health supplements or Cadillacs?” said G. Mark Alarik, President, Sales Overlays, Inc. While we weren’t able to get chewing-gum-granular with the data in this week’s chart, we break out the data by industry. The below chart is a combination of the following questions: Under what category can [company name] be classified? and Why do you ignore the print advertising you receive from companies with which you are [satisfied or unsatisfied]? Select all that apply. The “Other” in the chart refers to industries that didn’t have a big enough sample size to reliably analyze their data (utilities, business and industrials, basic materials, oil, gas and alternative energy). To see 35 charts from the study, download the free report. To put this data into context, we also asked consumers about the channels they were most and least likely to disengage from. 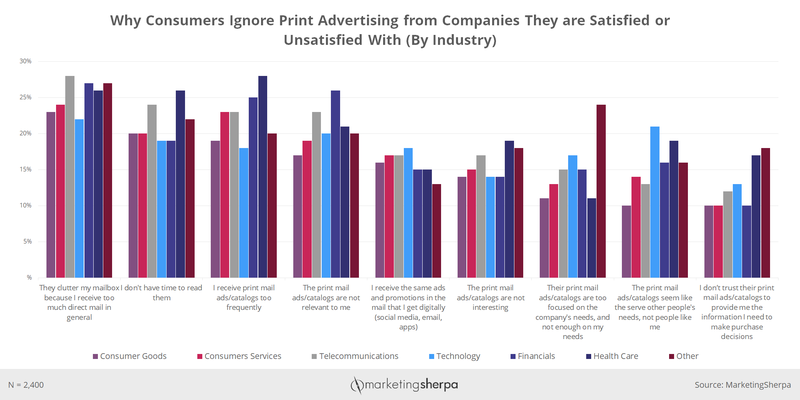 “Discard print ads or catalogs” was the second most frequently chosen response by unsatisfied consumers (52% said “often” or “always”) and the third most chosen response by satisfied consumers (34% chose “often” or “always”). So, if you’re sending direct mail, it is important to understand what factors you can improve to better serve your customers and keep them engaged with it. As you can see in the chart, for many of the industries, consumers’ responses were quite similar. However, two differences stood out to me after analyzing the data. Technology companies did the worst at sending targeted direct mail, with 21% of tech customers providing the same response. Who are we sending to? How can we be sure we are actually sending to the type of person we think we are? If we put the customers’ needs before our own, what value do these people specifically get from what we’re sending? That middle point can be a significant challenge, especially if you’re buying a list. For example, I’ve lived in my home for 16 years and I still receive direct mail promotions for the woman that lived there before me. This is direct mail that is meant to serve someone else’s needs and not my own. Customers of “other” companies (24%) were the most likely to say that the company was not practicing customer-first direct mail marketing. So, to reiterate that last bullet point, sure, you can send mail if you have a postal address. But why should the customers care? What’s in it for them? If you were a customer, what value would you need from the company to make it worth your time to engage with the direct mail piece? Although the above two responses were the ones that showed the biggest differentiation between industries, they were not the most common complaints about direct mail, overall, from consumers. While those complaints had a 13 and 11 percent spread among the most and least effective industries at direct mail, some of the most common complaints — “They clutter my mailbox because I receive too much direct mail in general” and “I don’t have time to read them” — had smaller spreads of six and seven percent between the most and least successful industries, suggesting that these complaints are more intrinsic to direct mail in general and have less variability based on the type of product. “Successful direct marketing is a component of a multi-channel marketing strategy. The goal is to position branding and drive response from across channels. So, a prospect might first see the ad via direct mail, then go to a website to respond,” Alarik said. Aside from simply being part of a multi-channel effort to help drive traffic to a landing page for final conversion, direct mail has some unique properties that could augment an otherwise digital-only campaign. “As Joe Pine once wrote, ‘The experience is the marketing.’ The big advantage of direct mail over other channels is it can include product samples and 3D items that enhance experience,” Alarik said. And you can combine this physical presence in a consumer’s life with the personalization you expect from digital. “Another advantage of direct mail is that it can be highly personalized and relevant to the individual. Current digital printing technologies now enable personalization on a near one-to-one level. I still don’t see many companies taking advantage of this,” Alarik said. Another point Alarik made when he reached out about the direct mail chart is that it is based on a survey, instead of hard analysis of actual buying behavior. He’s correct. The data is based on a survey of 2,400 consumers who were asked about their previous behaviors with a company. Even though we asked about behaviors, I would still consider this data to be preference data, instead of behavioral data. That’s because we were not measuring consumer behavior that we observed, but rather their recollection and admission of their behavior. Actual and reported behavior are not always the same. So, the best way to use this data about consumer preferences is to inform hypotheses you create in your direct mail experimentation. Although direct mail is not as easy and inexpensive to test as digital channels, marketers have been experimenting with direct mail for decades. “Feedback from surveys can be useful for creating test marketing campaigns with results we can measure,” Alarik agreed. And when running this experimentation (or any of your direct mail campaigns), it’s important to understand at what point your campaign ROIs and what success looks like. “Most direct mail campaigns are hugely successful at a 95-98% failure rate. Depending on the product, generating a consistent 2-5% response may be a very acceptable goal,” Alarik said. Are you sending to the most effective list? 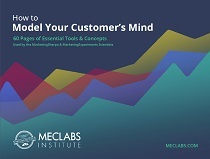 Would a customer-first marketing approach work better than your current approach? Questions like these — and any others that arise as you review the above chart — are great fodder for experimentation.